You’ve researched the Basenji breed in books and on the Internet, and perhaps even visited adult Basenjis and their breeders in your area. You’re ready to move to the next step—finding the Basenji puppy that is right for your household! The following questions will help you determine if a breeder is a responsible, dedicated, knowledgeable guardian of the breed or someone who produces puppies indiscriminately or for profit. Your goal is to find a healthy, well-tempered Basenji puppy from a breeder who will provide you with accurate information, support and assistance throughout your Basenji’s lifetime. The breeder you select should be a person you trust—a person of integrity who strives to maintain sound temperaments, good health, correct conformation, and longevity in every Basenji they produce. None of these questions, standing alone, should be the sole basis for determining whether or not to purchase a puppy from a particular breeder. These questions are intended to provide a framework for conversations with breeders, and as a springboard for acquiring additional information about a breeder’s practices. By selecting a reputable breeder, you maximize your chances of getting a healthy, happy puppy. They will also be a support network for the life of your dog. Basenjis can present unexpected challenges to the first-time owner so it’s important to select a breeder who is both willing to help you and knowledgeable enough to do so effectively. Responsible breeders never sell their puppies to pet shops or commercial brokers. Basenji pups that are for sale in pet shops are produced for profit, and without regard to health or temperament. The breeders of these puppies are not available as a resource for new owners, and responsible breeders can usually provide better and more accurate breed-specific advice than the staff of a pet shop. Also, a Basenji puppy from a pet shop often costs far more than a companion puppy from a responsible breeder. 1 | How long have you been involved with Basenjis? A person who begins to breed Basenjis immediately after acquiring their first dogs may not have the background knowledge to evaluate pedigrees for health and temperament issues, and may lack sufficient experience with the breed to provide accurate, on-going advice to puppy buyers. 2 | Do you belong any dog clubs, and if so why is it important to you? Belonging to the AKC parent club, Basenji Club of America (BCOA) or a regional Basenji club indicates that a breeder maintains some degree of contact with other people who are committed to the breed. As members, they receive publications that contain information about health testing, and other issues that impact the welfare of the breed. 3 | Do you show your dogs in conformation or participate in other activities (lure coursing, agility, obedience) with your dog? Breeders who show or participate in performance events have many opportunities to compare Basenjis of their breeding with Basenjis bred by others. They are more likely to be in the loop regarding important health information, and to be serious, life-long students of the breed. 4 | Do you health test the Basenjis you’re breeding? Fanconi Syndrome—DNA Linkage testing is available. All breeding stock should be tested "before" they are bred. All results are posted at www.offa.org and should be verified by potential buyers. 5 | What specific health concerns are behind the sire and dam of your litter? What can you tell me about the siblings and other relatives? Serious breeders talk openly about health issues they’ve encountered in their years of breeding, and will be able to tell you how they are working to avoid problems in the future. Two major health problems affecting Basenjis—Fanconi and PRA—occur later in life (after four years of age)—and even careful, knowledgeable breeders may encounter problems. At present, there are no DNA marker tests for these conditions. The best chance to avoid hereditary health problems like Fanconi and PRA is to purchase a puppy from a breeder who health tests the dogs they are breeding for common Basenji ailments, and has a good working knowledge of the family health history behind their dogs (not just the sire and dam, but the grand sire, grand dam, and other relatives as well). Make sure that all breeding dogs have been DNA tested for Fanconi using the linkage test. Go to www.basenjihealth.org to learn more. 6 | How do you select a sire or dam for a litter? Do you consider Basenjis from other breeders, or Basenjis that do not reside with you? 7 | How many litters do you breed per year? There are a few special circumstances when responsible breeders may produce two or more litters per year. Properly caring for and socializing a litter of Basenji puppies is time consuming work and a breeder who routinely produces multiple litters per year in their own home may need to cut costs on veterinary care, nutrition, or socialization. In some cases, these breeders produce puppies for profit rather than to improve the breed. A responsible breeder who is producing multiple litters will willing to discuss their breeding strategy with you. 8 | Do you have a waiting list for your upcoming litter? Breeders begin looking for good homes for their puppies as soon as they decide to produce a litter. It takes time to interview prospective owners (they need to check you out, just as need to evaluate them). Many breeders begin adding names to their waiting lists in Spring for a Fall breeding. A breeder who does not have a waiting list, or who waits until the pups are born to begin looking for homes, may not be taking the responsibilities of breeding seriously, or may not be putting enough time and effort into selecting good homes. 9 | How long do you keep puppies with their siblings and dam? Basenji puppies are not ready to go home with their new owners until they are eight weeks of age, or older. Breeders who send puppies home prior to age eight weeks may not be aware of the importance—for Basenji pups in particular—of spending time with siblings and dam, learning canine communication skills, and appropriate ways to interact with people. Puppies that are separated from their dam and siblings too soon can develop behavior problems later in life, can be difficult to house train, and may lack bite inhibition. 10 | How do you socialize your puppies? Basenjis require a lot of early, positive experiences with new people, places and animals in order to be well-adjusted adults. The breeder should be able to tell you, in detail, how they socialize their puppies, and what you can do to continue the socialization process once you take your puppy home. 11 | Do you screen prospective buyers? Will my entire family/household need to visit before we can be added to your waiting list? 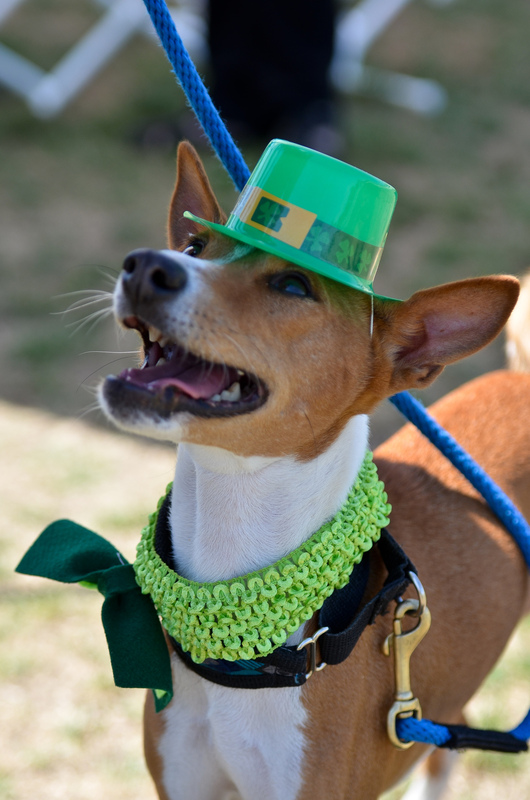 Most breeders who care about their Basenjis, and the breed, will not place a puppy with a person they have never met, or at least corresponded with extensively. Expect to be asked for references—including from your landlord if you rent. Expect to be asked to visit the breeder’s home if you are within a reasonable distance, and anticipate that all members of your household (children, anyone else residing in the household) will be asked to attend. A face-to-face meeting, where practical, helps the breeder find the best possible match for pups they produce and in the end is for the benefit of you and the puppy. When a personal visit isn’t possible, expect that a breeder will want to speak/correspond with you at length to ensure that you and your puppy will be a good match. A breeder who will sell/ship a puppy without references and a thorough screening process should be cause for concern. 12 | What are your spay or neuter requirements? Responsible breeders realize that breeding Basenjis properly takes a great deal of time, effort and experience. They do not want dogs they’ve produced to be bred indiscriminately, adding to the pet over-population problem. Requiring companion pups to be spayed or neutered indicates that a breeder is conscientious, dedicated to maintaining the integrity of the breed, and concerned about the welfare of each puppy they produce. Responsible breeders also have first hand experience with some of the demands of living with intact Basenjis—they understand that a person who is looking for a Basenji as a companion isn’t likely to want to face these challenges. 13 | Do you sell all of your puppies on written contracts, with AKC registration? Responsible breeders sell their puppies on written contracts. A contract will protect you, the puppy buyer, and clearly state the seller’s expectations. A responsible breeder’s contract will contain health guarantees and include a provision to take the puppy back at anytime during its life (even in old age) if you can no longer care for it. Basenjis are an AKC-registered breed. U.S. breeders do not need to use other U.S.-based registries. Many of these alternative registries were created to provide papers for dogs that are not eligible for AKC registration. The integrity of some alternative registries is suspect—particularly if the breed is recognized by the AKC—and the pedigree you’re given may not be accurate. 14 | How much do you charge for a puppy? Basenji breeders in the U.S. charge between $700.00 and $1000.00 for a companion puppy on a spay/neuter contract. There can be legitimate reasons for charging more or less. However, a breeder who is selling companion puppies for significantly more or less in your geographic area should have good reasons for doing so. A breeder whose fee is significantly below market rate may be producing too many litters and needs to sell quickly. A breeder who sells at an inflated price may be seeking to line his/her pocketbook at your expense. 15 | Can you provide me with references from other puppy buyers and Basenji breeders? A responsible breeder will have a long list of puppy buyers and fellow breeders who can vouch for their credibility, sincerity, and knowledge. They will not hesitate to provide you with references and will encourage you to contact them. Follow up on the references you receive—a disreputable person may give out names of well-known breeders in the hope that you will never bother to contact those individuals. Take the time to call or e-mail every reference you receive.